In the event of a normal pterygium excision, there is a 1 in 3 chance of the pterygium recurring. 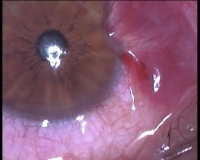 In combination with a conjunctival transplant, this risk is reduced to only 5 to 10%. Treatment is performed under local anaesthetic. 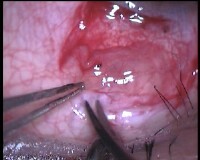 The most common complaint in the weeks after the operation is a gritty feeling in the operated eye. Additional treatments may consist of radiation of the operated zone and/or drugs to prevent scar tissue formation (Mitomycine C) in the operation area. 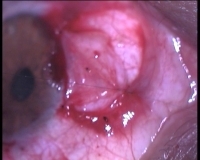 3. the site of the pterygium is cauterised. 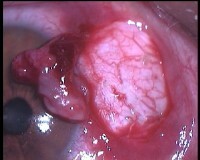 4. the site of the pterygium is prepared for healthy tissue. 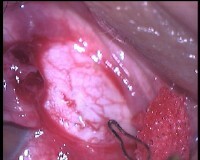 6. this piece of tissue will be transplanted to the site of the pterygium. 7. the transplanted connective tissue is attached.